It seems that the sandy dunes of the desert are at the top of everyone’s travel bucket list at the moment. It’s the “IT” spot to visit and get your new social media profile picture. But what if you can’t afford a vacation to Morocco, and the wondrous camel ride that goes with it? We have a better option for you! Look no further than your American back yard. It’s hard to believe the South of Colorado could boast dunes for as far as the eye could see. A seemingly quick (3hr) drive from Colorado’s capital Denver and you will feel as if you have stepped foot into another country. Boasting a massive 44,000 acres of national park beauty, this vacation will leave you coming back for more. Beautiful and never-ending, the dunes may seem extreme for some, although the mounds offer versatility in difficulty and allow people of all levels to experience them. A lot of people feel the base ridges are enough for them, but if you venture on and up you can find your own little slice of sandy paradise, with nothing but grains of sand and sunshine on your face. A truly magnificent highlight that a lot of National Parks don’t allow, is that the Sand Dunes are dog friendly, so feel free to bring your furry pal along. I’m sure they will appreciate the wide and open spaces as much as you will. After hours running, rolling and playing in the sand, no doubt that your dog will appreciate a dip in the Medano stream that runs at the base of the dunes. Take this time to kick back and float on down as you let the fresh alpine water cool you after an early hike. If you get bored (unlikely) of the rolling sandhills, venture further along and experience the aspen forests, alpine lakes and tundra, and you're sure to be kept busy. There is far more to explore than the eye can see, and even after a few days, you will still be seeing new and amazing things. 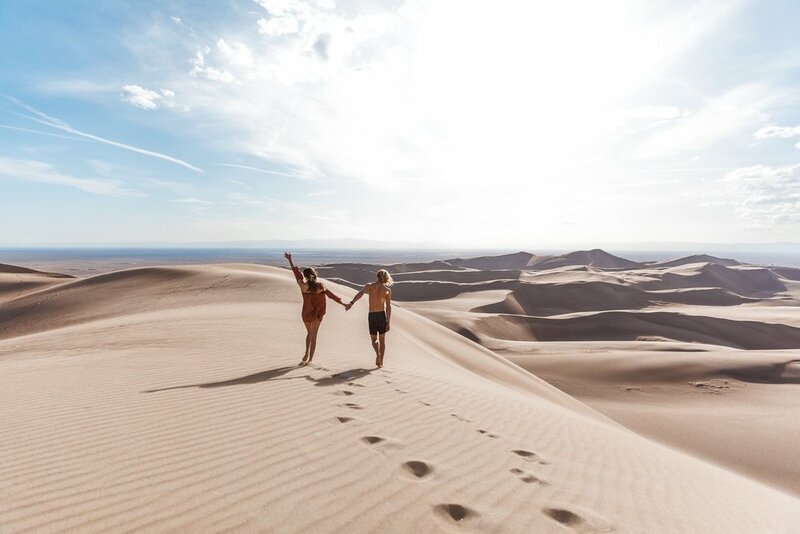 So if you have been dreaming of that desert escape, why not head to the tallest sand dunes of North America and create your own fun little exploration. From Denver – head South on highway I-25 for approximately 160 miles and then take highway US 160 West for about 59 miles. CO 150- N will be on your right, take that turn and from there it will be about a 19-mile drive. The drive will take approximately 3hrs 40 mins. Hiking the dunes – the average time given to reach the high dune is 1.5 hrs, although we climbed it in a speedy 35mins. Take water! Once your out in the dunes considering there won’t be any water sources available so pack plenty. In the summer the sand can get extremely hot up to 60 c. So if you plan on going around then make sure you go early morning or late in the afternoon and pack some shoes. Once you have reached the top of the dunes, wind storms are frequent, so make sure you pack sunglasses and bring something to cover yourself in case you get cold. There is plenty to do in the vicinity of the great sand dunes such as climbing, camping, 4WDing, swimming in the creeks, sand sliding, fishing and hiking.